It’s important for your home to be well-maintained so that you and your family remain safe, healthy, warm, dry and comfortable. It can also help to reduce your household running costs if your home is kept in a good state of repair. The following pages tell you all you need to know about how we can work together to look after your home. Learn about the different ways to report a repair, along with information about improvements to our properties we have planned for the future. 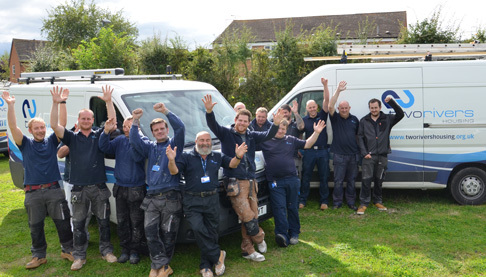 Find out about our popular Handyperson and Handyperson Plus service, as well as hints and tips on how to deal with the repairs that are your responsibility. For those tenants who have gas in their homes, there is vital information about your annual service, plus lots of advice on other heating systems. Read about how to avoid and deal with some home emergencies. We hope you will never have to use it, but it’s good to know it’s there if you ever need it. We will publish our estate maintenance schedule telling you when you can expect the area of communal grass near your home to be cut. To find out what type of cut you can expect, look up the map for the area where you live: green spaces maps . We also have great advice for you on saving energy and reducing your gas and electricity bills. Take a look at our Tenants’ handbook and also a set of Home energy advice leaflets in the ‘Library‘ for information on heating, lighting, reading your meter, understanding your bills, working out how much energy your home appliances use and lots of other hints and tips.